One of the things I enjoy most about landscape photography is the element of surprise, the anticipation that comes with never quite knowing what’s going to happen when I go out with my camera. I usually start with a plan, and while there are times I get exactly what I hoped for, many times I don’t. But it’s the times I witness something I never imagined possible that excite me the most. On the final night of my Eastern Sierra workshops I like to take my groups to Olmsted Point in Yosemite. The Olmsted trip is a particular treat because it presents a view of Half Dome’s less photographed east flank, behind a photogenic foreground of trees, boulders, and glaciated granite. (Another highlight of the Olmsted shoot is the opportunity to photograph Yosemite’s Tuolumne Meadows, the best experience of the High Sierra’s raw granite topography possible without a backpack.) But in 2010, after four days of spectacular photography, my workshop group’s Olmsted finale was jeopardized by an early snowstorm that closed Tioga Pass, the only route into Yosemite from our current base in Lee Vining. Disappointment would have been difficult given all we’d seen so far, but I nevertheless had already planned an alternate sunset location when I got word that Tioga had just reopened. I quickly returned to Plan A. As we ascended Tioga Pass, the storm’s vestiges darkened the sky and sprinkled our windshield and I wondered about another pass closure trapping us on the wrong side of the pass, suddenly six circuitous hours from our hotel. But the ranger at the entrance station assured me we’d be okay, so we continued on to Olmsted Point, stopping on the way to photograph at a couple of my favorite Tuolumne Meadows locations. Arriving about an hour before sunset, we found Olmsted Point completely enshrouded by clouds that obscured everything beyond 100 yards. Not quite what I’d envisioned, but the group had lots of fun exploring the nearby granite and creating compositions featuring large boulders (glacial “erratics,” deposited by retreating glaciers) and gnarled trees amidst the dense fog. As sunset approached I kept an anxious eye on the sky hoping for a break, wavering between cautiously optimistic and hopelessly resigned. Nevertheless, I reassured the group (and myself) with one of my favorite Yosemite axioms: It’s impossible to predict what Yosemite will be like in five minutes based on what it’s like right now. Shortly before “official” sunset (when the sun reaches the horizon on a flat, terrain-free Earth), the sky lightened noticeably. Hmmm. Soon the persistent fog still engulfing us started to glow, first amber and then pink and we quickly realized we were actually in the midst of clouds alive with the sunset color we’d all our lives only seen in the distance. This was both eerie and spectacular and everyone scrambled frantically looking for subjects, trying to photograph a moment that defies photography. Within five minutes the color was gone, leaving us all breathlessly grateful to have witnessed it with others who could validate what we’d just experienced. With night falling fast and the visibility still measured in yards, it would have been easy to pack up and revel in our success over dinner. But when the clouds in the direction of Half Dome showed signs of thinning, we greedily decided to stay put in the hope that Mother Nature had an encore for us. Just a couple of minutes later the clouds on the western horizon lifted, revealing Half Dome’s granite face against sunset’s orange afterglow. 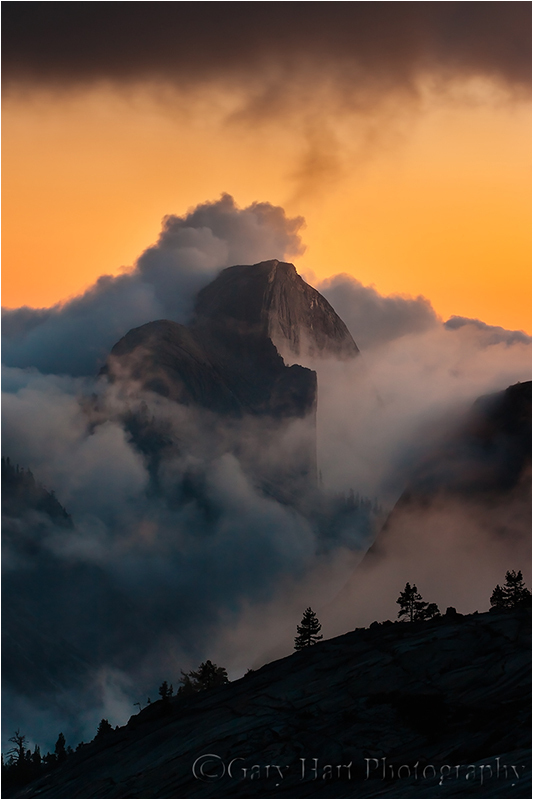 Everything after that was a blur of churning clouds, exposed granite, and deepening color as Yosemite’s most distinctive monolith emerged from its shroud. We were all positioned in close enough proximity that I could hear everyone’s amazed gasps punctuated by rapid shutter clicks. Confident that everyone else was content to be left alone, I went to work, frantically zooming wider and tighter, changing orientation, and swapping lenses, all in a futile attempt to capture every single compositional possibility before the darkness was complete. In addition to some amazing images, my group finished that evening with a first-hand understanding of how long after sunset the shooting can be good. And a good lesson on the rewards of patience. The great stuff doesn’t always happen, and I’ve had many a shoot where I waited in vain long after everyone else had packed up and retreat to comfort and warmth, but whenever I’m tempted to leave just because it would be more comfortable than staying, I remember this night and hang in just a little longer. Our final clicks that night were thirty second exposures that included stars, late enough that flashlights were necessary to make our way back to the cars. Dinner was really good. Like you, every time I visit Yosemite, it’s all new again! Just beautiful Gary. Some ask me “why do you go back to the same old places?” ……that’s why! Visually spectacular, Gary. You really know how to capture the moment. Thanks for an eye-popping set.